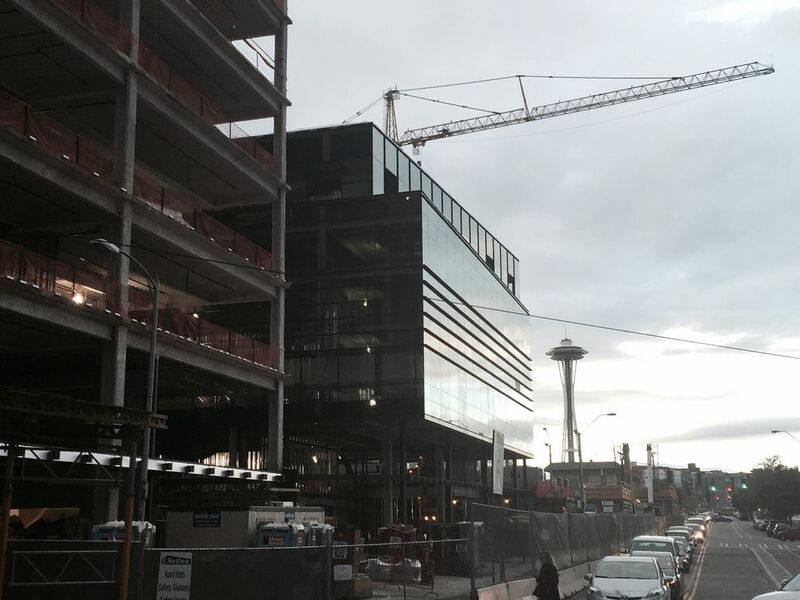 Construction proceeds on Amazon’s new headquarters campus in downtown Seattle. Photo by Brier Dudley. There’s much more to the tech boom than the forest of construction cranes, horrific traffic and hordes of geeks in Seattle, according to a new report on the industry’s regional effect. Across the state, information and communications companies employed 176,600 people in 2013, according to the report by the WTIA tech trade group, the state Department of Commerce and the Community Attributes research firm. About 62,300 other tech workers were employed at companies in other industries – the report noted the big tech team at Starbucks as an example – bringing the state’s tech talent pool to 238,900, in 2013. Compared with the national average, Washington has 2.5 times more people working in “essential” tech jobs such as application software developer, computer systems programmer, computer engineer, network architect and computer science researcher. The Seattle metro area has 4.3 times the national average for these types of jobs and 6.9 times more application developers than the average metro area. The state has 8,610 information and communications companies, most of which were very small businesses. The report said that in 2013, more than 90 percent of the state’s tech companies employed fewer than 20 people. At the other end of the spectrum are whales like Microsoft and Amazon.com. The report appears to have undercounted their output; it said state tech companies had total revenue of $36.9 billion in 2013 but Microsoft alone reported revenue of around $83.5 billion during that calendar year. Market value of just the top 10 public tech companies in Washington is nearly $600 billion and the value of all tech companies in the state is more than $1 trillion, the report said. Wages paid by the sector were $22 billion in 2013 but the report asserts that the industry’s wage impact is much greater. It estimates that each tech worker creates 2.7 more jobs in the state, and each “essential” tech jobs generates a least seven additional jobs. Combined, the companies paid $776 million in direct state taxes in 2013. The report estimated they paid more than $2.8 billion in taxes when counting secondary impacts such as spending and business transactions. The report, released as the Legislature debates education funding, said there’s an ongoing shortage of local talent for available tech jobs. It argues that the state needs to do a better job preparing college graduates for those positions. That may be the case, but the state also benefits when tech companies import smart people from other states and countries. You also have to be proud of local graduates who go on to make big contributions at tech companies located in California and elsewhere.